Experiment details: "Apo-Pc was first exchanged by repetitive ultrafiltration into D2O buffer containing potassium phosphate (50 mM), NaCl (1 M), 2-mercaptoethanol (l0 mM), and EDTA (0.1 mM) (pH* 7.0, direct meter reading uncorrected for isotope effect). 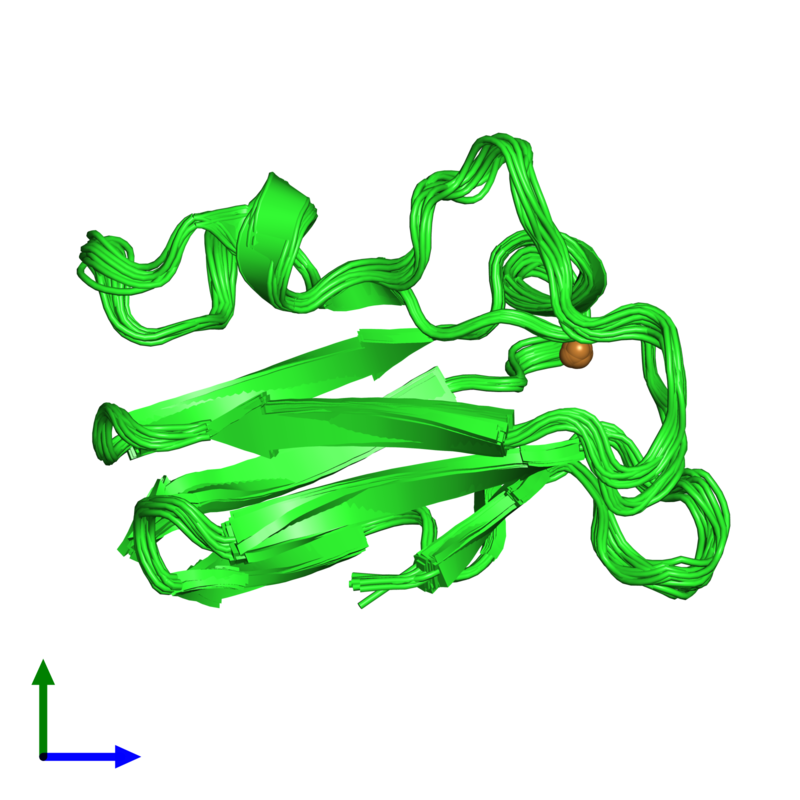 The protein was unfolded in the D2O buffer containing 2.2 M GuHCl and kept at 25C for 1 h. The refolding reaction was initiated by 1:21 dilution in D2O buffer without GuHCl. After a delay of 90 s to allow completion of the faster refolding reactions, the competition experiment was initiated by 1:9 dilution with either potassium phosphate (50 mM, pH 5.9) containing NaCl (1 M), 2-mercaptoethanol (10 mM), and EDTA (0.1 mM) in H2O or sodium acetate (50 mM, pH 5.0) containing NaCl (1.5 M), 2-mercaptoethanol (10 mM), and EDTA (0.1 mM) in H2O. The final pH values were 6.0 and 5.2, respectively." Experiment details: "Very slowly exchanging amide protons were identified on the basis of observation of backbone NH/CH peaks in 2QF-COSY or 2Q spectra acquired 3.5 months after exchange into D2O at pH 7.0."